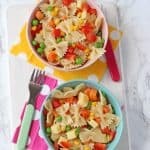 Feeding kids this summer is super easy with this delicious and quick Vegetable Pasta Salad recipe! Add the pasta shapes to a pan of boiling water and cook according to the package instructions. Four minutes before the end of cooking time add the frozen vegetables to the pan. Drain the pasta and vegetables and run under cold water for 30 seconds and then add to a large bowl. Mix in the corn and red pepper. In a small jar add the olive oil, honey, dried herbs and french mustard. Put the lid on and give it a good shake. Pour the dressing over the pasta salad and mix well. Serve immediately or keep in the fridge for up to 48 hours. Serves 4 large or 6 small portions. The nutritional information below is based on 4 large portions.